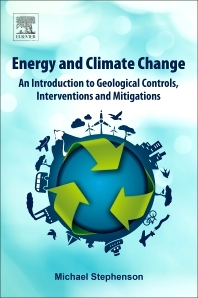 Energy and Climate Change: An Introduction to Geological Controls, Interventions and Mitigations examines the Earth system science context of the formation and use of fossil fuel resources, and the implications for climate change. It also examines the historical and economic trends of fossil fuel usage and the ways in which these have begun to affect the natural system (i.e., the start of the Anthropocene). Finally, the book examines the effects we might expect in the future looking at evidence from the "deep time" past, and looks at ways to mitigate climate change by using negative emissions technology (e.g. bioenergy and carbon capture and storage, BECCS), but also by adapting to perhaps a higher than "two degree world," particularly in the most vulnerable, developing countries. Energy and Climate Change is an essential resource for geoscientists, climate scientists, environmental scientists, and students; as well as policy makers, energy professionals, energy statisticians, energy historians and economists. 2. Natural global warming: climate change in "deep time"
3. Artificial global warming: the "fossil economy"
Michael Stephenson is an expert on energy and climate change and has a unique mixture of experience in modern climate and energy science, policy, “deep time” climate science, and coal and petroleum geology. He has published two books on related subjects and over 80 peer-reviewed papers. His recently published book Shale gas and fracking: the science behind the controversy (Elsevier) won an ‘honourable mention’ at the Association of American Publishers PROSE awards in Washington DC in February 2016. He is also Editor-in-Chief of the Elsevier Journal Review of Palaeobotany and Palynology. In addition, as Chief Scientist of the British Geological Survey, Michael Stephenson has represented UK science interests in energy, as well as providing extensive advice to the UK Government.